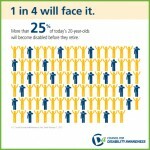 May is Disability Insurance Awareness Month. There are more than 30 million people in the United States between the ages of 21 and 64 who are disabled, according to the U.S. Census. The Council for Disability Awareness (CDA) works with the nonprofit organization Life Happens this month in order to educate the public about the risk of disability and the importance of planning ahead to protect your income in the event of a disability. 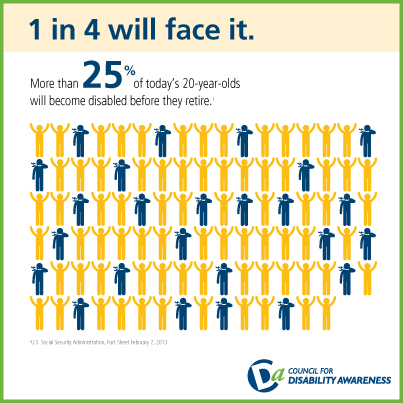 A study done by the CDA shows that many employees believe that they only have a 1% chance of becoming disabled for a period of at least three months. However, the truth is 1 of every 4 of today’s youth entering the workforce is likely to become disabled before they retire, according to the U.S. Social Security Administration. The Council has found that only 38% of employees fully understand their employer’s disability plans, while 48% said they didn’t have enough information to make a smart decision about purchasing disability insurance. This results in 69% of private sector workers having no long-term disability insurance. On top of that, over 100 million workers do not have private disability income insurance. While most people are able to receive Social Security Disability Insurance (SSDI) provided they paid a proper amount of FICA tax over the years, it is difficult to be eligible. 65% of initial SSDI claims are denied, in addition to it being a long process and the average monthly payout not being very high. Instead of having to rely on SSDI, many companies provide their employees with sick leave and short-term disability in order to aid their employees with a short-term illness or injury. Some even have long-term disability insurance that would potentially replace a percentage of your wages for an extended amount of time. One thing many people do not realize is the financial burden that can be caused by a long-term disability. A CDA Employer Disability Awareness Study showed that 65% of working Americans would not be able to cover their living expenses for more than a year if they lost their usual income. 48% of American families don’t even save any of their annual income. 33% of Americans don’t have a retirement plan. At the same time, the average length of a long-term disability claim in 2.6 years. That leaves the possibility of economic uncertainty. 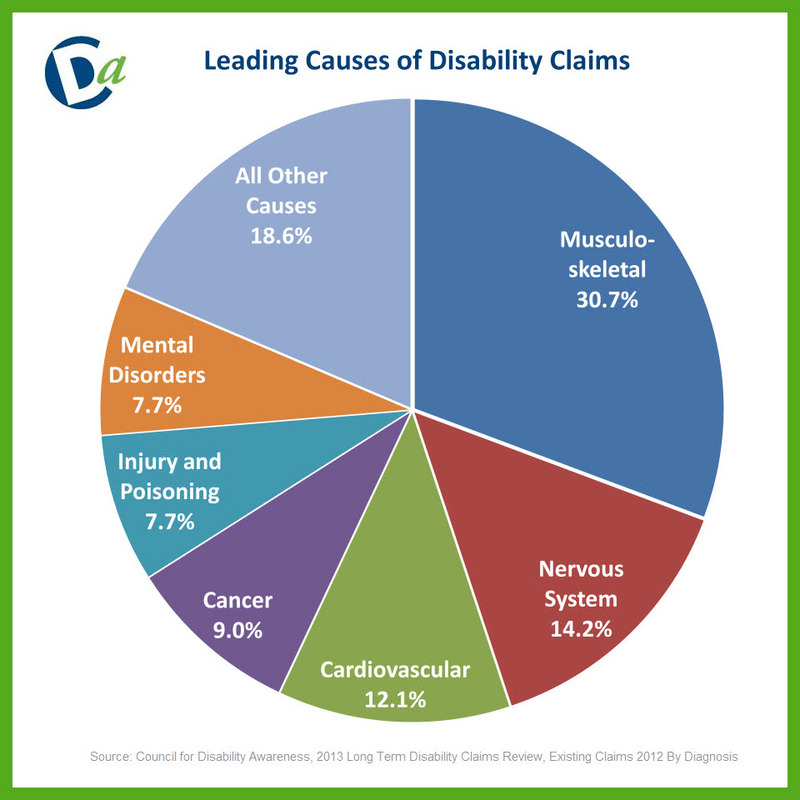 Most people think that the most likely cause for a new long-term disability claim is an accident on the job, but that is not the case. Injuries and accidents are actually only the third most likely cause, as of 2012. So Worker’s Compensation often will not help with a long-term disability. Muscle or bone disorders, such as arthritis, a herniated disk, back pain, or spinal/joint disorders are the most common cause for a new claim. But there are many other causes, such as cancer, mental disorders like depression or substance abuse, or even cardiovascular issues like hypertension or heart disease. Another cause that is becoming increasingly more likely for long-term disability among women is pregnancy. America’s Disability Counter (http://www.disabilitycounter.org) shows that approximately every 7 seconds, a new working-age American will experience a disabling injury or illness. The CDA offers a wealth of information and resources, ranging from financial planning to help reducing your chances of becoming disabled, as well as the studies that resulted in all the statistics above. Visit http://www.disabilitycanhappen.org to learn more. And call us at 516-484-5200 to see if you may need extra coverage in order to protect yourself.